Trump has picked a Republican politician, Rep. Jim Bridenstine of Oklahoma to oversee NASA, a job that often goes to astronauts or scientists. Who worse to lead the EPA than a man whose primary qualification is having sued the agency 14 times on behalf of polluting industries? Who worse to lead the Midwestern states EPA than a woman who the EPA cited for failure to control air pollution in Wisconsin and who deleted all mention of human-caused climate change from her department website? Who worse to lead the Department of Energy than a man who wanted to eliminate the department (until he forgot – oops)? Who worse to be the Department of Agriculture’s chief scientist than a right-wing birther radio host with no scientific background? And these are only the administration officials in positions related to energy and the environment. Chanh Kieu of Indiana University takes a look at the relationship between hurricanes and climate change. The physics of how an increase of sea surface temperature can increase intensity by 2-3% per degree is well-established, but hurricane have a good deal of natural variability, so establishing exact measurable links is still beyond us. Theoretically they should also move poleward. The most significant link in recent events was how Harvey got stuck in one place, which was quite unusual. Some research has indicated that the change in global climate could lead to a shift of the jet stream behaviors over North America. Well, not just North America. There are numerous examples of this happening around the world. At the time, rooftop solar accounted for 36 per cent (445MW) of electricity demand in the state. It should be noted that rooftop solar used directly by homes and businesses does not appear on the graph. The new record is notable for two reasons: firstly, it confirms that record low demand has shifted from the night to the middle of the day; and second, it did not occur in summer, as had been forecast by AEMO, but in early spring. Within 10 years demand is predicted to fall to zero with peak sunshine. Adani is set to begin work on the major solar plant it is building in the heart of Australian coal country: a 100-200MW affair south-west of Moranbah in Queensland’s Bowen Basin. State resources minister Anthony Lynham said on Monday that five “highly reputable companies” were in the running to build what could be Australia’s largest solar farm – a project of up to 450MW proposed for a 1,248 hectare patch at Aldoga, at the base on Mount Larcom. That’s near Gladstone, which is home to a 1,680MW coal-fired power station, the state’s largest electricity generator and is also known for its shipping port, largely used to export coal and, more recently, LNG. The construction of the new 5MW solar farm at the Summerhill waste management centre will add to the already established 2.2MW landfill gas generator, as well as a small wind turbine – and paves the way for battery storage and electric garbage trucks. This one is fairly small and will help offset usage at other Newcastle Council facilities. German-owned Australian renewables outfit Wirsol Energy, is set to begin construction of a fifth utility-scale solar farm in Australia, in this case, the 110MW Wemen Sun Farm in central Victoria. “By the end of the year we will have five solar parks in construction in Queensland and Victoria with a total solar generation capacity of circa 400MW,” Wirsol Energy managing director Mark Hogan said in comments on Thursday. All of those projects, Hogan added, were scheduled to be connected to the grid by mid-2018. “We have already secured for WIRSOL additional projects totalling circa 670MW, with the aim of reaching our target-providing 1 gigawatt peak of solar energy by 2020,” he said. And they are not planning to stop there. The newly listed Australian renewable energy developer Windlab has secured a landmark power purchase agreement (PPA) for what will be the country’s first grid-connected large-scale hybrid project combining wind, solar and battery storage. Windlab announced this week that it has secured a 10-year agreement with the Queensland government-owned CS Energy, which will buy both the renewable energy and some of the large-scale generation certificates (LGCs) produced from phase 1 of the Kennedy Energy Park. Kennedy is a 50/50 joint venture with Eurus Energy Holdings of Japan, and Windlab hopes to develop it into a massive 1200MW wind and solar project (plus storage) over time, providing the equivalent of “baseload” power in the north of the state. CS Energy has first option over the output of that expanded plant. Please note, CS Energy is a state-owned energy generator in Queensland. The Australian Renewable Energy Agency says it is seeking ideas to help it explore Australia’s potential to export renewable energy in forms such as hydrogen – a goal that has attracted the interest of japanese trading giants and leading players such as economist Ross Garrnaut and ex CEFC boss Oliver Yates. ARENA said on Wednesday it had opened a request for information that will close in one month, and seeks input from industry and researchers on where it should direct funding to boost the chances of building a renewable exports industry. The ACT has also extracted $180 million in investments in the hydrogen economy as part of its reverse auction scheme. The sky is the limit. it seems. During the parliamentary break Bob Katter took his long-time mate Anthony Albanese on a trip to show him his renewable energy plans. Bob is probably a climate sceptic, but he can see which way the wind is blowing. First was the Kidston pumped hydro project, which is actually happening. Second was the proposed Hell’s Gate Dam on the Burdekin River, where Katter reckons Turnbull promised action in return for confidence and supply. Katter is not pleased that he’s only getting another feasibility study. He reckons only a fool would forget a detail like that when they have a one-seat majority. Hell’s Gate would be used to generate hydro-electricity and to irrigate sugar cane crops whose waste fibre could be used to create the biofuel ethanol. Katter reckons it would create 20,000 jobs. Third was the Kennedy Energy Park, mentioned above, eventually a $2 billion project combining wind, solar and battery storage. Phase two will be based on an enormous plateau of 80,000 hectares with a world-class wind resource on it. “I mean, how could any Government conceive of the stupidity like another base-load coal-fired power station in North Queensland?” Mr Katter rejoined. I have the feeling Malcolm Turnbull and Josh Frydenberg would be an irrelevant joke, except they have enough power to seriously get in the way. However, having said this, it highlights the potential for reducing the need for gas fired power by doing things to reduce peak non-solar demand. Using energy storage and moving increasing the percentage of power that is used as controlled (off-peak) clearly makes sense. John, I can only go back to the post AEMO sees electricity markets reshaped. And here’s the rub, the maximum daily demand will increase overall and migrate to later in the day when the sun doesn’t shine, while the minimum will decrease and move to the middle of the day. 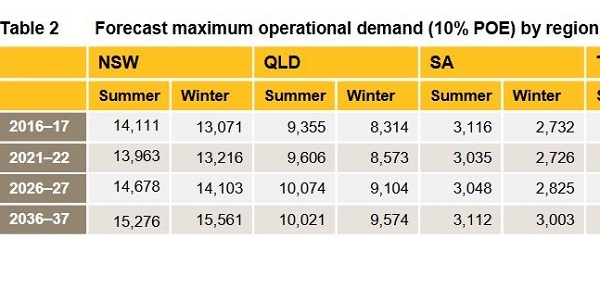 So in 20 years time the minimum demand in summer in NSW will be 2,236 MWh in the middle of the day, followed by 15,276 a few hours later. The net effect is that the market will be drastically disrupted by the prohibitive expense of new ‘clean’ coal and the increasing tendencies of consumers, domestic and business, to provide some or all of their own power. Renewables in the NEM system in the eastern states will not reach 50% before around 2025 when batteries will be competitive, leaving aside pumped hydro, molten salt and other storage systems. 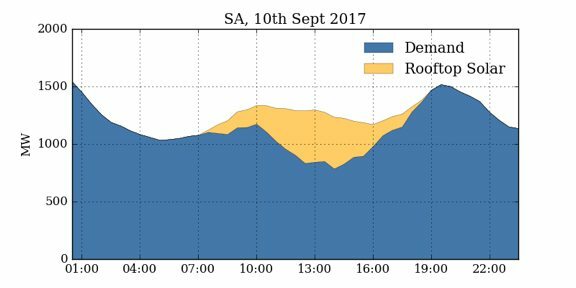 SA I believe are at about 40% renewables in the NEM, with rooftop solar increasing rapidly, so their daily patterns will change. In a sense they are indeed a laboratory for the rest of the system. Their prices are high because they have the highest proportion of gas in the system, with no remaining old coal and are having to get into storage while it is mor expensive than it will be. Just a thought, maybe move to a more more individual system of energy generation and use rather than a socialised one ? Off grid independent sort of thing. Some really good ideas to think about here. Some are going more “individual ” but are happy to share any excess electric power generated with others (through a local or wider grid). It’s not “one or the other”. Yeah A Man, ground up through market philanthropy. Not many votes in it but it’s a proven winner. Jumpy: Going off grid may satisfy the need to be a hairy chested individual but it means that there will be times when power is wasted because it has nowhere to go and/or there won’t be enough power to do all the things you want to do. It can also mean that you are more vulnerable to breakdowns. In Brisbane you can’t get a residency certificate if you turn off the water. This is despite town water not being available in Upper Brookfield and parts of Brookfield. I actually feel a bit the same about power. – Should a house that has a small peak power pay the same as an airconditioned mansion? – Incentives to reduce average power consumption? – Incentives to reduce peak power consumption? – The financial cost/benefits of adding demand or installing rooftop are much much different depending on how close we are to needing a major grid or generator upgrade. My understanding is that the real benefit of the growth of rooftop is that it has allowed expensive grid upgrades to be avoided. John, those are all relevant questions, I’d reckon. I was thinking of urban and suburban areas rather than a farm. One of the main considerations is that if a lot of people go off-grid then the poor will be left behind, and network expenses will become very expensive for them. The idea that the big users pay more for network services is very much worth considering. A grid of some kind is also necessary if consumers are going to share. Parts of WA are finding off grid and microgrids are better than being connected to the larger grid. Fed up with frequent outages and voltage spikes, six farming households in West River, 500 kilometres south of Peth, chose to take a leap of faith and try living off the sun and lithium batteries. “It has been just fantastic, it’s far exceeded our expectations, and it’s very good, clean power,” West River resident Ros Giles said. “Friends are often out [without power] for up to 24 hours and thinking, ‘we might come visit because you’ve got power and we haven’t’,” she said. WA’s energy utility Western Power offered the systems for free in the search for alternatives to the massive cost of replacing ageing poles and wires. The utility builds and maintains transmission lines in remote areas, but landowners wear the cost of the lines on their properties. Rows of interconnected batteries on shelves. The Giles family spent tens of thousands of dollars connecting their farm in the 1980s. When the region experienced major flooding in January, receiving 310 millimetres of rain in four days, the solar units kept the lights on while many grid-connected customers lost power for days. “It’s good, clean, reliable power and that’s the big advantage,” Bernie Giles said. “Cleaner meaning frequency and voltage consistencies … and that means less damage to things … like electric fence units with voltage spikes and fluctuations. Connecting to the larger grid is expensive and the case for simply going off grid or being part of a micro-grid is going to get stronger and stronger. Particularly given the chaos we are getting from brother Turnbull and his “mates”. John, thanks for the link. I recalled talk about Ergon thinking of microgrids rather than connecting remote communities to the grid. A search revealed that Ergon has had a microgrid policy since 2014. Here’s a 2015 piece where they say they already have 33 diesel-based microgrids, which could partly or wholly switch to renewables over time. This one talks about a hybrid PV mini-grid with 200 kilowatt of rooftop solar in Lockhardt River. Then they’ve done a study into a microgrid in Cairns, so that power could be maintained if the network suffered cyclone damage. Not quite the same, but here a story about Ergon signing to take power from Mount Emerald Wind Farm in FNQ, with 170MW or enough to power a city the size of Mackay. No doubt the RET is contributing, and it’s going on under Matt Canavan’s nose, so I guess the idea would be to stop it to make space for coal baseload in NQ, which would actually be irrelevant to what’s happening. Thanks for those articles, Brian. I am a fan of Bob Katter mainly for his solar pro active interest. He is demonstrating that a bit of free thinking is energising for the whole community providing a very broad spectrum of opportunities. Thanks for the link to the heliospiti, Jumpy, that was a good read proving yet again that off grid is very doable. Meanwhile Liquid Piston is progressing and there are now many more investors so it will not be too long before the optimal backup generator is available. As to the “poor being left behind”, I don’t think that this is a consideration in the medium term. The reason being that ultimately a household solar system will be a modular kit with the full spectrum of features (just as a car is a multiplicity of features all purchased as one functional package) which will be fitted at a standard price and financed as a mortgage component, on the one hand. On the other the cost of an off grid solar energy system is paid for from offset costs with the only ongoing cost once the system is paid out is for maintenance and the mains gas component (which will ultimately be supplied by local councils) for cooking and backup energy if included. Bilb: Have you any feel for how much power is required for cooking? Brian: I was aware that Ergon was using microgrids to avoid the cost of connecting to the main grid. Alyangula and Newman both functioned as diesel microgrids when we lived there. The system worked OK . At Newman we needed to ring the power station before starting up so they could start an extra generator. A system powering electric shovels and the concentrator sometimes led to temporary brown outs. Shovel power consumption varies substantially depending what the shovel was doing. Given the speed with which a diesel set could be started up a diesel/solar combination would make sense at current prices. On brown-outs, when we did a big microcomputer buy in Qld schools in the mid-1980s the contract went to Sperry to supply what were known as MS clones. They had a weak power transformer, or whatever you call them, and when the power fluctuated they went Pop! We found out how unstable the Qld power system was at the time, especially for schools near an open cut mine or a sugar mill. BilB, I have one question, really. Should there be a power line running down all suburban streets, and to shopping strips, and if so, who should pay for it? Brian: Draglines don’t help because they pull a lot more power when filling and lifting the bucket. They used to say at Curragh that the whole of Qld would drop out if all the draglines were synchronized. I remember living in Moranbah with the brownouts due to just restarting the things after a half day strike, wow that must draw a bit ! No drama when they were just operating as usual though. I also remember after the 08 flood a mate that is solar off grid with generator backup had 14 of his friends and neighbours freezers and fridges in his shed. Funnily he couldn’t get the ” financial assistance ” that was being chucked around but he’d do it again if/when need arises, good Bloke Kevie. John D, Power for cooking can vary a huge amount depending on the family development stage. The issue with Stoves is that even today they are universally controlled by a device that regulates the power to the elements randomly (via a heated bimetal strip to which electrical contacts are fitted). The problem with this approach is technically every element on the appliances that is being used despite the setting (low/high) can be on at the same time albeit for brief periods. So the cooking time may be just 30 minutes with elements at a variety of consumption levels pulling as little as one and a bit Kwhrs, but the instantaneous current pull could be as much as 6.5 to 10 Kws (depending on the number of elements, their rating and whether they are being used or not). So a household with one Tesla or RedFlow battery is not going to be able to cope with that momentary power draw. That is why I think that the stand alone off grid system is better using gas for the cooking function. Some time in the future appliance builders will discover the need for electronic energy regulators in which the power can be shared out under household control rules of keeping power draw under a ceiling to avoid accidental trip outs. Brian, As I have been saying for some years now, I think that we will follow the trend in the US where micro grids are developing. But I imagine even smaller grids than those models where the houses are connected along their back fences via an underground cable (I’ve been looking into ways of achieving that) for a whole block and then over time blocks combine to form optimally sized networks to match local backup power generation units. The network thread might be connected to a larger broad grid through which the local network could buy power at better rates to top up batteries at opportune times, or for specific needs such as charging electric vehicles. Bilb: Thanks for the stuff on cooking. Hadn’t appreciated the peak draw issue. Apart from using gas or being careful what you cook and how you cook it is possible to store heat for cooking. (Seen it in barbecue resteraunts in Sth Korea.) Might also be able to use controls to limit peak or use DC in combination with batteries with a high discharge rate? I have this vision of a very micro grid that delivers DC from rooftop to shared batteries and an inverter. Might combine this with using more DC in the house. Lights and a lot of other stuff can run on DC without modifications and other things like washing machines could run on DC with a more expensive DC motor. The may be savings by the use of larger, shared motors and inverters? Many of the poor are tenants. Ar some point it will be useful to get landlords and landladies to install solar pv and solar hot water. Could tenant pay a fixed weekly charge to slowly reimburse landlady capiral outlay, while tenant enjoys lower consumption charges for electricity and/or gas? Set the fixed charge at a level where tenant will be ahead?? Set the fixed charge at a level where the tenant will be ahead?? Ambigulous, I would expect that a tenant in an off grid house gets the benefit of the free energy as part of the house use package and the cost of the capital is accounted for in the rent. When most houses have the solar features that cost would be neutral. For tenants in non solar dwellings there are plenty of examples of solar clip-ons that the tenants take with them when they move. It is early days yet in how the systems develop. The thing that we have to realise is that most of the distributed solar installed in Australia has been structured, as it has turned out, to benefit the grid operators. Most roof systems now are receiving only cents for the electricity that they feed into the grid for the grid retailers to bill right back to the public at retail rates, and they have just put the price of that up. The energy con goes on and on and on. To turn that around the households need to install battery storage designed to be charged from the solar panels directly. and yes the prices are coming down with plenty of competition. This is looming reality that AGL are all too aware of, and Turnbull and Co appear totally oblivious to. When people have a close personal interest in the powering of their households, all evidence suggests they suddenly develop energy conserving skills and habits. When people have a close personal interest in the powering of their households, all evidence suggests they suddenly develop energy conserving skills and habits. A truer set of words have never been written, substituting “energy ” for any other commodity rings just as true. I meant grid-connected tenanted houses, but your reply applies. Yes, the full benefit should flow to the tenant, including benefits of using less energy. John at 9.47pm on 17th. I remember one of those. We used to call it “cheaper off peak power”. Electricity companies used to sell it to people in the olden days. The benefits of solar to a tenant will vary depending on usage patterns and the power contract. Makes it hard to put a figure on reasonable rental changes and it is debatable what effect solar would have on the extra rent new tenants would be willing to pay. On the low feed-in tariffs, now 11 cents per kWh in Victoria, is there a role for the ACCC to intervene and set a higher minimum? Or if household reaches a particular total of fed-in power, company waives connection charge for that period? Step forward, imaginative power companies. There is nothing to lose but your poor reputations, and a world to win!! I can see microgids being established in new housing developments, and in better-off suburbs. Everywhere else there is a fair sprinkling of people, or even a majority who are doing it pretty tough. So I can’t see how we get to an entirely new system starting from where we are. There is also a problem with multi-story and business/commercial areas and other large scale entities. I’ll need to find a link, but Brisbane airport has announced plans to install solar the equivalent of twice the area of the MCG. It will save them from memory $11 million a year, which is only 10% of their bill. On pricing, Victoria has been talking about price control, nominating a fair return (maybe 10-12% rather than 30), and everyone gets some advantage. Turnbull has declared victory because 100,000 have scouted around and got cheaper plans. Problem is, after they finished the jawboning, he said there were 2 million out there who could ring up and get cheaper plans. So what’s happening with the other 1.9 million? I’m suggesting that price control should include a fair return for electricity supplied to the grid by households. Thing is, we already have a grid to share electricity, so why dig up the back yard? Sorry if I’m being obtuse! Obtuse?, no. Its a fair comment. From my perspective a one who sees a multiplicity of opportunities and benefits in the trransition to distributed power generation, there is one very large advantageto rear fence services provision. Where I have been staying in Chicago in the leafy suburb of ——– electricity runs along the back fence in the green belt between houses. They don’t have the fobia about coring out trees to clear the cables so the visual impact of the power lines is minimal and they provide a highway for squirrels and chipmunks. What I am imagining for Australia is for a mini tunneling machine to bore a tunnel under the rear fence line which would be lined with a continuous strip feed technique which is used for sewerage line repairs. The advantage here is that the rear fence is free of other services other than sewerage and would have an easy installation run. So finally there would be a minimal cost method for removing most if not all of the ugly power poles from our streets. Yes, the power still has to go from the back fence to the meter box which would cause some disruption, but there again the hydraulic punching system would be suitable so disruption and cost would be minimal. There are benefits for the power retailers too in that their distribution service responsibilities and costs would in the medium term be substantially reduced. Rooftop solar decisions are easier to make in states that have gross feed in tarifs. (Solar owner pays for all solar produced and pays for all electricity used.) Net feed in tariffs like we have in qld mean that return/cost depends on usage pattern. In Victoria, we are paid only for surplus power fed into the grid. Right now with all the talk and experience of high gas and electricity prices, might make solar equipped rental houses a more attractive choice for renters. But yes, every family has a different pattern of use. BilB, I’d be in favour of putting everything underground, and the back fence makes sense. may of the houses being built now as infills in older suburbs like ours are so wide that a human being cannot walk from the front yard to the back without going through the house. Too bad in a fire, and electricity meters need to be in the front. I think that’s true everywhere. That’s why they talk about “behind the meter”. Coal now in short supply! They can be read remotely now like water meters, they don’t even need to be outside the house. On gross feed in tariffs the rates are too important and too inflexible. I remember a story of a German smartarse that got such a generous standard feed in rate that running spotlights onto his solar panels during the very cheap off peak usage times made a profit. I think nett tariffs would motivate more to get storage too. Jumpy, I’m not questioning your expertise, but I’m minding a house at present for some people who are away. It’s got a fence with a gate that is padlocked. The week the meter is read I have to leave it unlocked so that the meter reader can get in. Hasn’t been fitted with the new meters perhaps ? Anecdotally, I knew a bloke that rented houses to fill with hydroponic weed that got caught out by a ” smart meter “. Apparently Ergon alert the Police if unusually high constant electricity is happening. Even wireless battery charging is taking off ! The stuff Nikola Tesla was experimenting with a Century ago. In 10 years it will amaze us the technological leaps these geniuses accomplish. Also, water companies report unusual consumption. Agree about advances nowadays, but surprised it has taken so long… CSIRO had primitive solar hot water for households in early 1960s. Mass manu facturing perhaps needed modern computer control? (John and BilB can advise). Edison, Maxwell, Marconi, Baird, Fermi, and the beat goes on. Jumpy, when they come back I’ll tell them about remote meter reading. Makes sense. Jumpy: Gross feed in tariff systems provide more certainty and make it easier to estimate what the benefits will be. In general, certainty encourages more competitive prices. Brian, In a microgrid power metering would be a very local affair as the grid members are producing most of the energy themselves and the meters are for monitoring power levelling, sharing, and the share of energy imported from the external grid when that occurs. Such a system would be monitored via internet connection with all transaction managed automatically via a local computer. Having said that I do agree that there are complications, with some for specific situations possibly being too difficult., with some particpants possibly excluded. Micro Tunneling,….not a new concept. Bilb, I’m wondering how deep you’d have to go. We have bluestone under our place.  600mm below the finished ground surface for cables installed in other locations. Where physical obstructions such as other services make it impossible to achieve these depths, additional mechanical protection should be provided by means of a minimum cover of 100mm of 20 MPa concrete or equivalent. Any additional mechanical protection should be marked with the words electric cable or similar along its length.  900mm below the finished ground surface. This clause does not apply to that part of an underground cable or an underground control cable entering or leaving the ground vertically or fixed above the ground to a secure structure, so long as adequate mechanical protection is provided. Thanks, Jumpy. Those depths sound doable. I think our sewerage line is about 6 feet down and we were told by the old guy who lived next door when we came that when it was put in progress was 6 to 9 inches per day.